Having already done some Manchester United predictions for 2019 today, I’m ready to have a look in my Liverpool crystal ball as well. Apologies in advance if I jinx anything, Reds fans, but I’m expecting this to be a pretty good year for people who are fans of never walking alone. There. I’ve said it. Liverpool will end 29 years of hurt and lift the Premier League trophy for the first time (yes, yes, I know football existed before 1992, I mean this particular edition of the trophy). The signs are all there – they’ve been top at Christmas, which is almost always a good indicator, unless you’re Liverpool, who were also top at this stage of the season in 2008/09 and 2013/14, finishing second each time. Still, their lead is pretty healthy at the time of writing – seven points ahead of Manchester City – and they have the best defensive record in the country, letting in just eight in 20 games, which is pretty remarkable. There’s an old saying that attacks win games and defences win titles, and we’ve definitely seen so far this season that this LFC side can win ugly due to the world class ability and leadership of Virgil van Dijk in defence. Even when Mohamed Salah and co. are not firing, there’s usually enough in that front three for one goal. Unlike last season, this side no longer needs to score three to be safe. And hey – cards on the table – this may be wishful thinking on my part. As an Arsenal fan, I feel like there are various reasons for me to back the Merseyside giants. Firstly, if they can progress as they have under Klopp then there is hope that Arsenal can perhaps replicate that in a few years’ time. I’ve also always felt a certain sense of solidarity with Liverpool fans, perhaps due to a shared hatred of far more offensive teams in Manchester United and Chelsea. 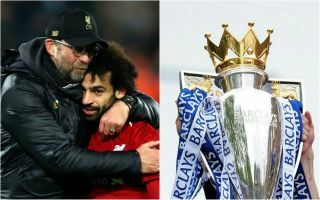 Plus, Klopp’s side are great to watch and, for all the money spent on players like Van Dijk and Alisson, they are not bankrolled by, shall we say, questionable, owners like Manchester City – a soulless club who were nothing until they got lucky in 2009. Okay, this is arguably more ambitious than going ahead and winning the title, with 15 goals against over the course of a 38-game Premier League season the target they’re up against. That record was set by Jose Mourinho’s extremely dominant Chelsea side of 2004/05, and no one’s come that close to beating it since then. How satisfying would it be for Liverpool to be the team to not only inflict the defeat that got Mourinho sacked at United but then also steal one of his most impressive records by the end of the same campaign? As noted above, Liverpool are currently on eight goals conceded after 20 games. If they are to break this record, they can only afford to let in six more in their subsequent 18 games between now and May. Hmmm. Their next game is Manchester City away. Am I starting to regret this prediction? Maybe. But this team looks better placed than any other in living memory to go ahead and do it. Hard to know how these will go, but if Liverpool do win the Premier League, or even if not, the contribution of certain individuals is unlikely to go unnoticed. Mohamed Salah was the star of this side last season, winning the Golden Boot and PFA Player of the Year. At this rate, you wouldn’t bet against him doing so again. And perhaps adding the Ballon d’Or later in 2019, with Luka Modric finally ending the Messi-Ronaldo stronghold on the trophy to blow it wide open. Virgil van Dijk could also be a strong contender for PFA Player of the Year if he continues to lead with such quality performances as he has done. The Dutchman is truly world class and the difference in this squad since he joined is unmissable.